In this tutorial I'm going to help you find the best Blacksmith in the Witcher 3 and explain how to craft the strongest weapons in the game. Some of you will have followed my previous Master Armorer tutorial and many of the same principles apply here too. By now you've probably claimed several of the school gear sets (Griffin, Cat and Bear) and maybe even some of the upgrade diagrams as well? Keep those close to hand because it's the school gear that unlocks the strongest weapons in the game, if used with the right level Blacksmith. The key to crafting the best weapon lies in the type of the diagram but also in the skill of the particular blacksmith. Only a Master Blacksmith can craft the highest level diagram known as Mastercrafted. In the case of weapons we're talking about Steel and Silver Sword diagrams from one of the top tier schools: Griffin, Cat or Bear. Each school has it's own bonus rewards and you should study the diagrams in detail to decide which school best suits your play style. Once you've got the base diagrams for one of the schools, you can craft a basic Steel or Silver sword at any Journeyman Blacksmith. 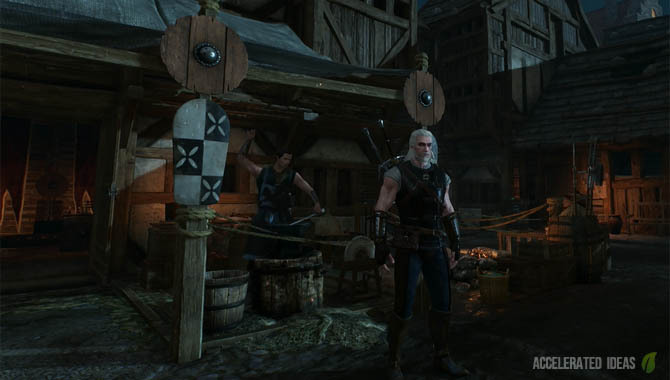 Then as Geralt progresses through the levels, and opponents become harder to kill, you should consider upgrading your weapons to the stronger types. Players must upgrade in ascending order starting from the base weapon. First you craft the enhanced version, then onto Superior and finally Mastercrafted. If you inspect the crafting ingredients for any upgrade you'll see that one of the components is the previous tier version. So to upgrade to Superior you must own the Enhanced version of the sword. Just like the Master Armorer, the Master Blacksmith remains a secret until you complete a particular quest. In this case, the Blacksmith is called Hattori and he lives in Novigrad. Working under the disguise of a cook, this craftsman is willing to make you some of the best weapons in the game if you help him out first. 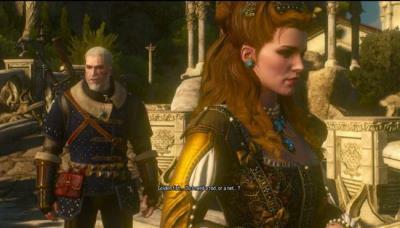 Simply visit his house and talk to the NPC to open up the quest option. The exact location of the Blacksmith is shown on the image above. 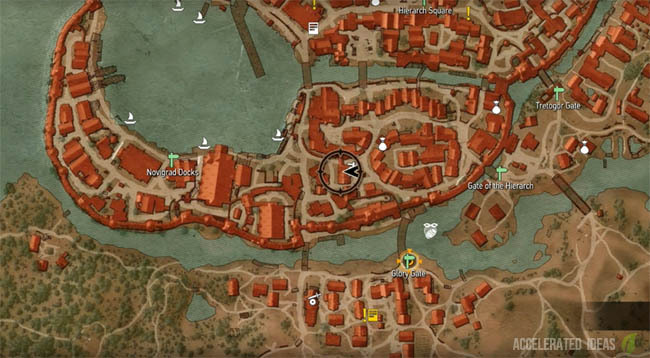 Nearest Sign Posts are Novigrad Docks to the west, or Glory Gate to the south. After speaking briefly with Hattori, he would like you to join him in a meeting with one of the King of the Beggar's men, in an attempt to negotiate the supply of smithing materials. In return he'll craft you a "sword fit for killing gods". Accept his request and the "Of Swords and Dumplings" quest will be added to your list. This quest is longer than the Master Armorer quest and unfortunately not quite as interesting. But that's ok because we're just interested in unlocking the Master Blacksmith option to progress towards the end game. This is a recommended Level 24 quest and for good reason. Although the quest contains many cutscenes taking us to around 45 mins in length, there are many level 24 enemies along the way, all of whom are human opponents requiring a steel sword or a fist fight. Another important point to note: the reward for completing this quest is a Steel Sword (in addition to unlocking the Master Blacksmith merchant). Therefore, avoid buying any new Steel Swords beforehand and make do with a lower level weapon. This inferior Steel Sword will ultimately be replaced by the reward for this quest thus invalidating the point of buying anything new beforehand. Make your way to the docks area and if necessary meditate until after dusk (7pm onwards) to activate the next cutscene with Hattori. For the next part of the quest you'll need to follow Hattori and then try and negotiate the costs with the King of the Beggar's men. The outcome of this negotiation doesn't seem to have much effect (besides maybe some XP) so choose to accept the deal early to progress. Before you know it, you're under attack from Cleaver's boys, a small group of Level 24 dwarfs. Get your Steel Sword ready and make good counter attacks to save the durability of your sword for later fights. Following the encounter with the Cleaver bandits, Hattori now needs personal protection - something that Geralt is unwilling to provide himself. So it's off to find Sukrus and engage in a fistfight to convince him. This fight is barefists only, no weapons and no Signs. Thankfully it's just a one on one fight with enough room to easily dodge attacks. Sukrus now asks you to do him a favour. Speak to the Skellige merchant and convince him to pay his debts or otherwise destroy his goods. At this stage of the quest you've got two choices: either convince the merchant which requires Delusion Level 2 OR destroy the barrels using your sword and fight off the merchants in a sword fight. To destroy the barrels simply draw your sword and swipe away. As soon as the first barrel is destroyed the merchants will attack you. This sword fight is one of the harder fights in this quest line. You'll have to defeat several opponents at once to make it through. Speak to Hattori and gather some men ready to ransack the warehouse for ingredients. Speak to the dwarf at the warehouse door and pay him 200 crowns to gain entry. Use your witcher senses to find the three creates and mark them with chalk. Ernst van Hoorn is waiting for you outside the warehouse. He's a level 24 human with some lower level friends. Fight off the attack and move onto the final part of the quest and claim your reward from Hattori. The hard work is over now and your reward is a nice little notification signifying that you have a Master Blacksmith at your disposal. But that's not the end of this quest so head back to Hattori and meditate a few hours for him to craft you a new sword. The reward in question is a Steel Sword called "The Blade from the Bits". It comes with a +50% Critical hit damage bonus - quite a handsome bonus. The major downside is that this weapon will scale to your level. At the time of completing this quest the sword was scaled down to Level 16 and my other Level 17 gear outranked it.